The HTC One is not new to the scene, and I’ve been using it for a good month or 2 now and I think it’s such a lovely device. My first Android device was a HTC Desire Z and that was back in 2011, never have I thought I’ll be a HTC user yet again. I must admit that I was actually looking at HTC devices when I was hunting for my Desire Z replacement. The HTC One X, One S and One V were in my consideration but in the end I settled for the Samsung Galaxy Nexus (i9250). Moving on, I’m now a HTC One user simply because of the camera, audio output and battery life. There, the review should just end here and we could all move on with other articles. 😛 Do stay on if my ramblings interests you. Now the HTC One is powered by the QualcommÂ® Snapdragonâ„¢ 600, quad-core 1.7Ghz processor, the one I’m using comes with 32GB Storage and has 2 GB DDR2 RAM. For details on supported network, just have a look at it at the official product page. The HTC One comes with HTC BoomSoundâ„¢, Dual frontal stereo speakers with built-in amplifiers with Studio-quality sound with Beats Audioâ„¢ (copied from the product page). While the camera is HTC’s UltraPixel Camera with BSI sensor, Pixel size 2.0 Âµm, Sensor size 1/3′, F2.0 aperture and 28 mm lens with Optical Image Stabilization (OIS). The aluminium finish is nice to see, comfortable to hold. The 4.7 inch is in Full HD 1080p (1920 x 1080 resolution) and the surface material Corning Gorilla Glass 2. It’s so smooth to the touch that I actually dropped it once as it slid off some other object when I placed it face down. Scary stuff, it fell off at arm rest (of a sofa) level but there were no visible signs of damage, I don’t intend to drop it again though. I love the finish, the details are seen even on the volume buttons that blend nicely into the frame yet not being difficult to locate. As you can see from the images so far, the device has sharp edges all around but they are nicely done in such a way that holding it for long hours wouldn’t be much of an issue. The corners are rounded so it fits to your palm just perfectly. Even during long gaming sessions, heat is spread across the whole back bezel there is no imbalanced heat distribution. The battery life is superb. I used to need to use Juice Defender just to hope the device lasts for a day but this is not the case. Sometimes I could go on for as long as 2 days. It’s not exactly 24 hours but it’s good enough to last from morning of Day 1 and lasts until end of Day 2, of course this is not possible once the usage intensifies. Put it simple, even at 1% – I can finish a game or 2 of Bejewelled Blitz at full volume and brightness. Speaking of volume – the audio output is superb. The audio quality is rich and the volume is loud. Loud is good but this also means it could be embarrassing when you forgot to switch to silent mode during events – OOPPPSS! Everyone knows you’re a BANANA fan. I was also blown away by the camera, probably because I’ve been using devices with less than stellar camera capabilities all these years. Here’s a sample photo I took ……. and here’s another, taken indoors with special light setup ……. And to add to that, the HDR function is superb on this camera. What the HDR mode does it that it takes a few pictures and balances the dark and the bright areas to give you a well exposed photo, refer to the example below. The camera is not perfect though. More often than not, I find the camera under-exposing my photos. This is bad for Facebook updates BUT it helps a lot as it preserves a good base for me to post-process. The chicken chop photo above went through some post processing. In fact the photos posted here went through a varying degree of post processing. The photo below was not post-processed at all. The camera has a function to adjust exposure but it doesn’t work well since the exposure is just by 1-stop. So if it’s 1/3 or 2/3 stop under exposed, adding +1 to the exposure makes it over-exposed. For more food photos, you may visit the photo album of my food blog’s Facebook page. Click here to check out my foodie adventures with the HTC One. Let the numbers do the talking. Nice Phone. I love it. The 32GB variant can be acquired for a little under RM 2,000 these days. The OS is with Android 4.2.2 right out of the box (at least, according to a few of my contacts). 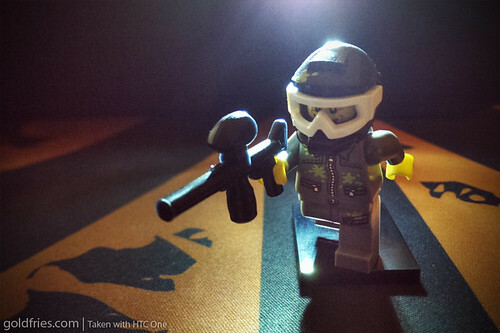 *NOTE : Some HTC One users have indicated camera problem where it shows a blue or purpose cast. © 2007 - 2019 goldfries.com | Powered by WordPress | Theme by goldfries | 71 queries in 0.222 seconds.